It is important that you know your rights in any situation. Whether you are pulled over for a suspected driving while intoxicated or being questioned for a more serious criminal offense. Our attorneys have put together some helpful information on an app that you can take with you wherever you go. A list of the most important rights you need to know about in any situation involving police officers. If you are in a situation where you need to record some audio that could help you later on, this feature allows you to do just that and quickly email the audio file to our criminal defense attorneys. This feature is just for fun. If you want to estimate what your Blood Alcohol Concentration might be, you can use this calculator. Again, it is for entertainment only and should not be used to make a decision about driving. Our advice is that if you’ve been drinking, have someone else drive you home. If you find yourself in a situation in which the police are taking you under arrest, you can notify your loved one with the press of a button. The app will send a text message to any person you designate along with a GPS location of where the arrest is taking place. The message will also direct your loved one to contact our attorneys for help getting you released from custody quickly. If you’ve enjoyed your night out and need a ride home, this button allows you to call a local cab company to come pick you up. You’ll get home safely and you won’t need our help. The app gives you multiple ways (email/phone) to contact our Criminal Defense Attorneys in the event that you need our services. We offer Free Consultations on all criminal cases. While we enjoy helping the good people of Tarrant County and the Dallas Fort Worth Metroplex, our sincere hope is that you never need our services. 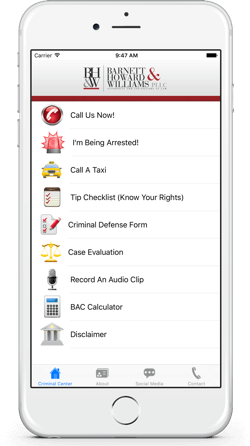 This app could help you make the right call and avoid a criminal charge. Make sure you read the disclaimer, which indicates that downloading the app and using the app does not create an attorney-client relationship with Barnett Howard & Williams PLLC. An attorney-client relationship is only created once you have signed an engagement contract with our firm. Download the app and use it when you need it. If you ever need to contact us, open the app and hit the “Call Us Now” button. We always provide Free Consultations on criminal cases.